By 1776 the Stanhopes, who had bought the Stapleton estate in 1590, had in 1628 become Earls of Chesterfield and were resident at Bretby Hall in Staffordshire. The land agent who managed their estates now probably lived at their old seat at Shelford Hall; certainly he did in 1841. Sir Philip Stanhope, 5th Earl, had inherited the title from his distant cousin in 1773 and reached the age of 21 in 1776. Thus it is possible the estate terrier was produced to verify his holdings on attaining his majority and thereby control of his estates. The source document is a folio volume of parchment pages containing details of the Earl’s holdings in Nottinghamshire. Each large holding was described with a series of plans on the left hand page and a text list of each close with its identification number, name and area (in acres, roods and perches) on the right hand page along with the name of the tenant. Smaller holdings were two or three to a page and a number of very small holdings (generally single houses), had no plan. Freeholds had no plan either. Buildings were coloured red and roads brown. Street names were not given. Holdings were shown in their correct spatial relationship with a scale bar (which varies with size of holding so as to fit everything on one page) and north arrow (the orientation of which changed between pages to accommodate different land parcel distributions). 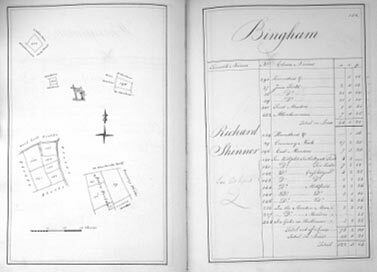 We are confident that the main enclosure programme for Bingham was carried out around 1680-1690. Thus the 1776 maps would represent many of the field boundaries resulting from the enclosures. We assumed the tithe map would be a good model for the 1776 boundary pattern. The plans include holdings of closes and of houses and homesteads. Field boundaries were largely identifiable on the tithe map either as individual fields or where a large 1776 enclosure had been broken up into smaller parcels by 1841; in some cases we needed to insert boundaries onto the tithe map accurately to represent the 1776 field pattern. Frequently the boundary notes for one named field would refer to the name(s) of the adjacent field. 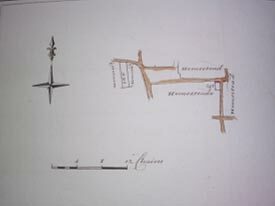 The sketches of the homesteads or houses showed roads, but generally only the portion adjacent to the property, making it difficult in a number of cases to locate them on the tithe map. Fortunately sufficient sketches were relatively easy to locate - figure 2 is a good example. Intuitive assembly of what were assumed to be adjacent parcel numbers together with reference to the tithe map, led to our placement of the others. Plans were not given for freehold properties or where an occupier just had a house. In these cases we had to assume property numbers would be sequential and assign some locations on this basis, again using the tithe map as a model. A copy of the data base table listing all holdings is here. The first column is the reference number of the survey page image for the holding and is linked to it. The column ‘thumbnail in images?’ tells you if there is a thumbnail sketch plan for that property.